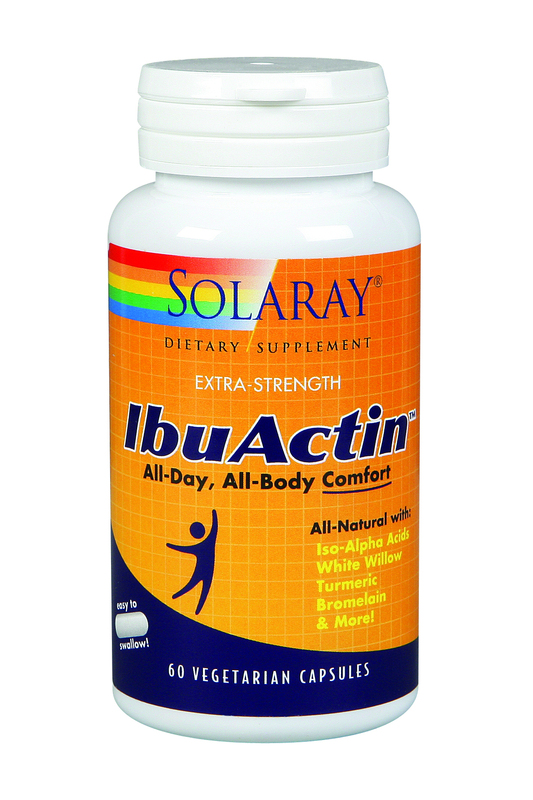 Natural supplements such as Solaray's IbuActin, contain the clinically studied Perluxan ingredient. TAMPA, FL--(Marketwired - Feb 18, 2015) - The cure for chronic pain is no cakewalk. The Herbal Pharmacist, David Foreman, R.Ph., says the Oscars may have overlooked Jennifer Aniston's portrayal of a woman suffering with chronic pain in the new movie, "Cake," but chronic pain is not a topic we should ignore. He says prescription and over-the-counter drugs can make chronic pain worse, since many medications are designed to block the transmission of pain from the site to the brain, so over time nerves send even stronger pain signals. "Chronic pain frustrates physicians because it's complex to treat and there is no medical cure," said Foreman, who started his career as a registered pharmacist with a strong belief in natural medicine and uses his expertise in physiology, pharmacology and natural medicine to educate consumers on cutting edge approaches to natural health and healing. "A multidisciplinary approach that addresses the whole person is helpful and can provide much needed relief to chronic pain sufferers." 1) Perluxan: a supercritical extract from hops cones (Humulus lupulus L.) found in the form of an ingredient. In pilot human oral dosing studies, Perluxan was found effective in reducing pain-causing biochemicals and 1,000 mg of Perluxan was evaluated to have a similar effect as two, 200 mg ibuprofen tablets, with a good tolerability and safety profile for gastrointestinal side effects (www.perluxan.com). 2) Celadrin: one of the most effective natural anti-inflammatory compounds that come from specific esterified fatty acids derived from bovine tallow oil. Celadrin can be used as a topical pain reliever cream or taken orally as a supplement. It works much like the essential fatty acids EPA and DHA from omega-3 fish oils, but with a more dramatic result because it causes changes at the body's cellular level. It decreases inflammation and lubricates cell membranes throughout the body, restoring fluids that cushion bones and joints to promote flexibility and mobility. Clinical studies on Celadrin have reported significant results without any side effects (http://www.celadrininfo.com). 3) Magnesium: new studies have found that it can help with pain caused by conditions like migraines, muscle spasms and fibromyalgia. Magnesium helps the muscles to relax and newer studies show it can calm down nerve pain too; additionally it can help you sleep better and alleviate gastrointestinal problems often associated with pain medications. Foreman says exercise, hot Epsom salt baths and meditation can also be helpful. Sufferers of chronic pain have some of the lowest reported quality-of-life levels among people with major illnesses. Approximately one-third to three-quarters of the people with chronic pain experience some form of depression because depression and chronic pain share some of the same neurotransmitters and nerve pathways. For more tips go to: www.herbalpharmacist.com, or follow on Twitter at @Herbalrph.